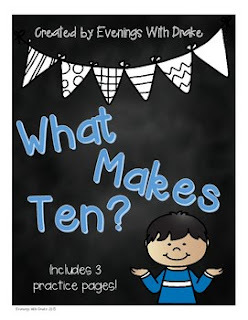 Making Ten/What Makes Ten? This product was created for the purpose of helping students remember all of the combinations in which ten (10) can be made. It is directly correlated to CCSS for 1st and 2nd grades. What's included: 2 "What Makes Ten?" anchor posters; "What Makes Ten? Student Visual Learning Aid (left side/boy; right side/girl); and 3 activity pages.